Last Sunday I performed for Tristan’s 7th birthday party in Kenmore (outside, at St. Edward State Park) and for Mary Jane’s 80th birthday at the classy Maggiano’s Restaurant in downtown Bellevue. Totally different audiences, environments, attire, and material, but the same outcome: another satisfied customer! This booking came to me through http://www.gigmasters.com/Magician/Jeff-Evans/. Normally I’m kind of skeptical about online event marketing services like Gigmasters, but of all of the similar sites (gigsalad, eventective, thumbtack, etc.) Gigmasters is, without a doubt, the king. The site works properly for clients and performers, and they consistently generate the most leads. I have all 5-star reviews since I “joined” in 2008, giving me probably one of the few 100% ratings. See the good news at http://www.gigmasters.com/ClientFeedback.asp?rowID=29411. We found Jeff to be very responsive to our particular needs. The event was my mother-in-laws 80th birthday party. His performance was perfect for the occasion. He delivered everything that was promised. Guest are still talking about the magic tricks.Would hire Jeff again. Thanks Jeff! As folks were finishing dinner I distributed a magic trick to each guest. They opened their souvenirs and began reading the instructions for their tricks. Within a few minutes people began performing their trick for their friends at the table. One of Mary Jane’s grown grandsons was excitedly going from table to table “scaring” people with his magic mouse. Funny! Next, the four grandkids each related a story about their grandmother. Mary Jane is an incredible person. A former nurse, she works to this day as a “visiting angel” helping patients who, I’m sure, are frequently younger than her! Next it was time for the main event. I entertained the full group for a half hour+. Mary Jane helped with two of the routines and at the finish I “baked a cake” by magic. 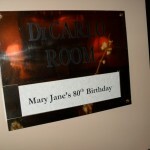 I’m looking forward to being part of Mary Jane’s 90th celebration! Whether you’re planning a 40th birthday, a 90th birthday, or anything in-between, count on my magic to add that special touch that your family and friends will talk about long afterwards. Call me in Olympia at (360) 412-5064, send e-mail to jeff@amazementproductions.com or visit www.amazementproductions.com/jeff.html. 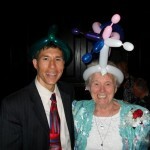 This entry was posted in Uncategorized and tagged 80th birthday, adult birthday, Bellevue, birthday party magic, gigmasters, Jeff Evans, Kenmore, Maggiano, magic, magic show, magician, Seattle. Bookmark the permalink.